Anemos, as you might already be aware, is a luxury fan haven in Raghuvanshi Mills but it hosted a one of a kind event on the eve of 30th November 2013. 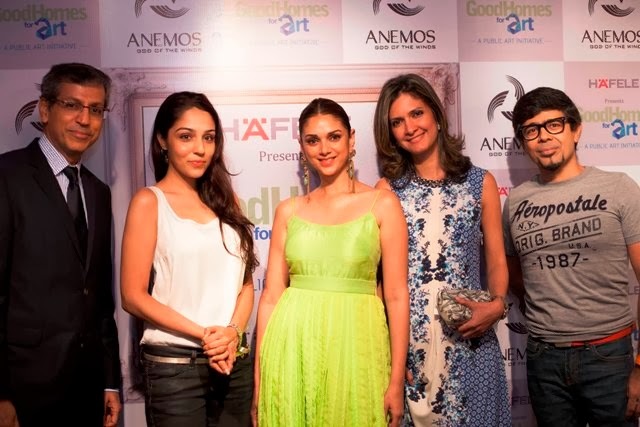 Actress Aditi Rao Hyadri, Interior Designer Nisha Jamwal, CEO of WWM, Mr. Tarun Rai and the Managing Director of Hafele, Mr. Jurgen Wolf were the attendees that graced the opening of the exhibition on Fridayevening. They all, alongwith the Directors of Anemos - Mr. Rajkumar Jain and Nipoon Agrawal lit the Diya that was staged in the middle of the functional art exhibition to mark the beginning of this weekend long exhibition taking place at Anemos. Functional Art is being hosted by Anemos as part of the GoodHomes for Art 2013 which is a public initiative in order to foster art and will be on till December 1st, 7pm. “GoodHomes for Art” was launched in 2012, with the idea of being an ‘art week’ in Mumbai with the aim of making art accessible i.e. bringing art out of galleries and into the homes of people. GoodHomes India Art Week in Mumbai is stated to be a highly successful edition drawing an influential audience from around the city, strengthening its position as a leading art fair. Scheduled from 25th November 2013 to 1st December 2013, Good Homes India Art Week brings together celebrated artists from across the city showcasing their most exciting artwork. The event aims on bringing art out of the closed doors and in the process, making art less intimidating and more accessible.